Imagine you are out to dinner with your family, having fun. You order food and drinks for everyone. While enjoying your food with your family, your waitress comes up to you and says they served the wrong drinks to your children. What kind of wrong drinks? Alcoholic drinks were served to your children. Yes, this really happened. A restaurant serves alcohol to a 2-year-old and her 5 other family member, under the age of 8. The Montoya family, in Colorado Springs, said this happened to them on Wednesday night at Joe’s Crab Shack. “One of my aunt’s favorite places to eat is Joe’s when she comes into town,” said Trista Montoya. The Montoyas claim they order a kid’s drink, off the kid’s menu called the shark nibble. Around 30 minutes after the drinks and food were brought to the table, their waitress came back and said the drinks were made with the wrong ingredients and took them away. The manager came back with the correct tray of drinks and let them know that they had accidentally poured alcohol into the kid’s drinks. This alarmed the family, because their 2 year old niece had already finished the drink. They believe the mix up of the drinks is because Joe’s Crab Shack offers a similar drink on the adult menu called the shark bite. The shark bite contains rum, vodka, blue curacao, and grenadine. 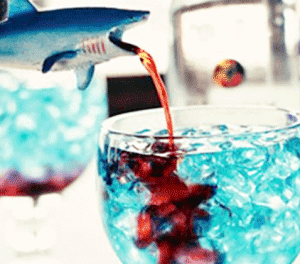 The shark nibble contains a fruit punch and grenadine. Both of these drinks come with the same shark toy and look very similar. The manager claimed the drink mixes were labeled incorrectly. Joe’s Crab Shack is looking into this incident. One of the 6 children complained of feeling sick, so they called the paramedics. The children were checked out and cleared to leave. The Montoya family was upset, because they trusted that the restaurant would know how to properly serve their drinks and food. They claimed that they would never think to check and make sure the child’s drink was actually just a drink and not alcohol. With this mislabeled situation, some people are wondering if this was the first time something like this has happened. The Montoya family hope that their story gets other parents attention, so they do not have to go through the stress and panic that they went through.